Members of the New Jersey-Albanian Operational Mentor and Liaison Team gather at the Albanian Ministry of Defense and are joined by top officials including, from left, Maj. Gen. Maksim Malaj, Chief of Albania's Defense Forces; Maj. Gen. Glenn K. Rieth, The Adjutant General of New Jersey; Albanian Prime Minister Sali Berisha; U.S. Alexander A. Arvizu, U.S. Ambassador to Albania; and in blue suit, Arben Imami, Albanian Minister of Defense. 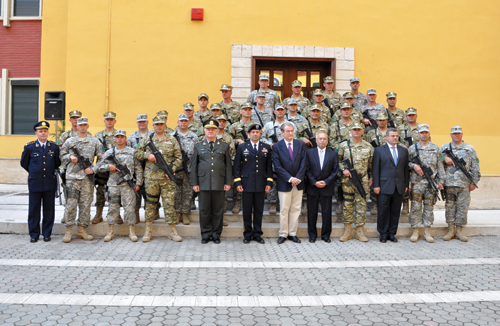 TIRANA, Albania -- The New Jersey National Guard is poised to make history in Albania – again. A delegation of senior military leaders from New Jersey and Albania joined that nation's prime minister and the U.S. ambassador at a departure ceremony for a combined team of more than two dozen American and Albanian Soldiers who will deploy to Afghanistan later this month. The Soldiers will serve as an Operational Mentor and Liaison Team (OMLT) and will be paired with an Afghan Army battalion to train its troops on everything from logistics to combat operations the first such pairing since the New Jersey National Guard and Albania launched its partnership more than 15 years ago. "This is a historic deployment and a testament to the cooperation between New Jersey and Albania," U.S. Ambassador Alexander A. Arvizu said at the ceremony at the Albanian Ministry of Defense. Maj. Gen. Glenn K. Rieth, the Adjutant General, said that National Guard team and their Albanian counterparts made the most of the pre-deployment training they received at Fort Polk, La., Germany and in Albania. "The training and team building has been a success and the team is ready," Rieth said. "It will be a very challenging mission." Members of the OMLT said the joint training helped build trust and overcome any minor communication barriers between the Soldiers from the partner nations. "It was a little challenging at first, but we now feel like one unified unit and I think together we're going to hit the ground running and provide the Afghans some good training," said team member Sgt. 1st Class Luis Morales. Maj. Gen. Glenn K. Rieth, right, and U.S. 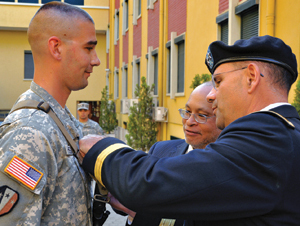 Ambassador Alexander A. Arvizu promote Operational Mentor and Liaison Team Team Member Eric Heislter to sergeant following the unit's sendoff ceremony in Tirana, Albania. The joint team will be led by an Albanian lieutenant colonel and includes an Albanian officer who graduated from the United States Military Academy at West Point as well as the Albanian Army's top non-commissioned officer. New Jersey Army National Guard Maj. Keith Mackey is the executive officer. In addition to the sendoff for the OMLT, the New Jersey delegation visited key training facilities and met with Albanian counterparts who have become friends during the years the two countries have been participants in the State Partnership Program.